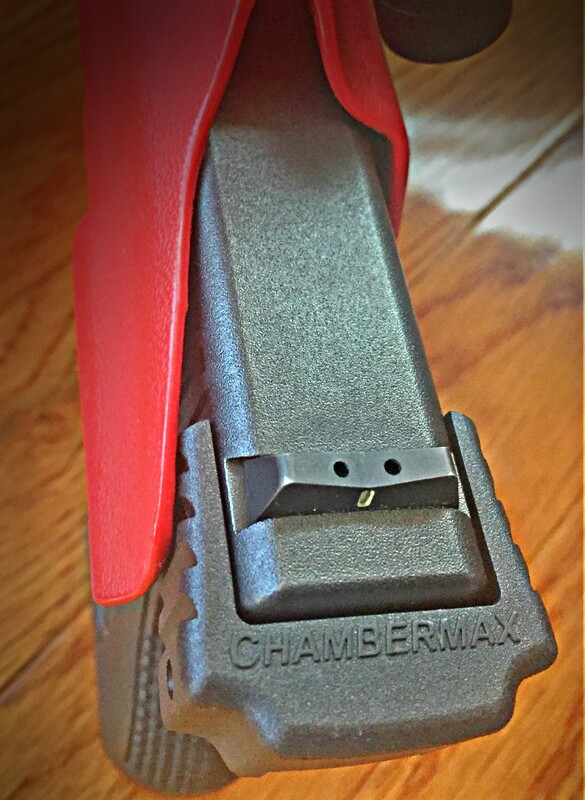 Enhancing the grip you get on your slide is simple with this effective device from Chambermax. 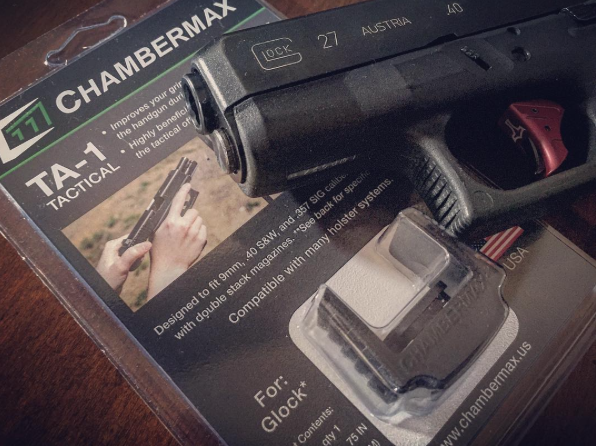 I have to hand it to the fellas over at Chambermax for making a simple product that could seriously find a place on every Glock owner's firearm. Seriously, from the newbie to the patrol cop, the TA-1 is a simple yet ingenious device that dramatically enhances the grip surface of your slide. Being able to properly manipulate your firearm is important in so many different ways. The ability to rack your slide is a core ability you must have in order to safely handle your firearm. Not only administratively, while chambering and clearing your firearm, but tactically when clearing a stoppage or reloading. With firearm ownership and the number of concealed carry license holders dramatically rising every day, a more diverse group of people are carrying and handling firearms. Difficulty racking a slide is something that affects a good percentage of gun owners, and it is a real problem. So What's the Big Problem? The TA-1 gives the user an enhanced gripping surface for reliable slide grip under many different scenarios. An inability to easily rack the slide may be due to a number of reasons and granted sometimes the difficulty of racking the slide comes from improper technique. But many times, it is because the person simply lacks the dexterity or strength. Elderly shooters with arthritis or weak hands often have an issue, while some women claim their firearm is just too difficult to rack. And there are folks who have had an injury to their hand which temporarily or permanently reduces their dexterity, strength or ability to rack the slide confidently. (I personally know two Marines who lost fingers and strength in their hands due to traumatic injuries). When people can't confidently and easily rack the slide, they end up forgoing their ideal firearm for something else. Combat Marine @Nubgunner refuses to let his injured hands keep him from being the warrior he is. He has mastered racking his slide without a TA-1, but having the TA-1 provides injured warriors who have not regained their hand strength. Inability to rack a slide doesn't just drive people from the ideal gun, as if that wasn't bad enough. A HUGE issue that occurs when someone has a gun they can't confidently rack the slide on, is they end up handling the gun in an unsafe manner. I see people twisting the gun and contorting their bodies in all kinds of weird yoga-type positions in order to get the slide open. Many times during this contortion act, the gun flags everyone on the range including themselves. Not a good situation for anyone. So far it would seem that if you don't have any issues racking the slide then you don't need a device like the TA-1. I will challenge you to think of some alternate scenarios that you may not have thought of. You are probably aware that one of the physiological effects of stress on our bodies, is the loss of fine motor skills. The nimbleness of our fingers is reduced, making it hard to do things that require precision. This is a reason why most instructors will teach the ‘over the top' method of racking the slide while performing immediate action drills. 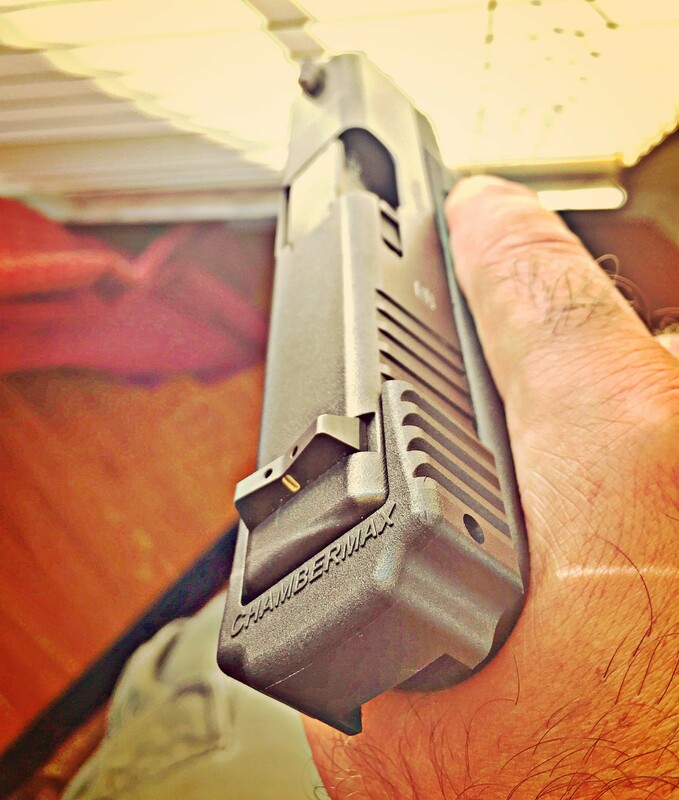 As you may know the over the top grip allows a far better chance of properly getting the gun back into action, as opposed to hitting a small slide stop with your thumb. But even this method has its vulnerabilities. Take for instance a situation where you are defending yourself against an attacker, and you end up with blood all over your hands. Blood is slick, and if for whatever reason you have to rack your slide with blood covered hands, it can be much more challenging than with clean hands. What about when the temperatures drop down low and you are wearing gloves? No matter what type of glove you wear, you do have some diminished slide grip. How about being in a situation where you need to rack your slide one handed? It's a possibility, and there are several techniques you can use. 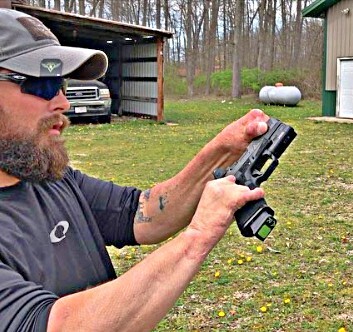 However, most of these techniques require you to have a rear sight that has a 90° edge, so you can use it on your belt, boot, or another object. But some styles of sights don't have this edge. Popular Novak style sights have a front edge that is like a ramp, making this technique very difficult if not impossible. The TA-1's wider profile and shape create a perfect ledge for one handed racking of your slide. So what is the TA-1? The TA-1 is a simple device that installs on the slide of your Glock, and provides the user an enhanced gripping surface. It is made from a polymer material, requires no maintenance, and unlike other products that perform a similar job–the TA-1 does not wear down and lose its effectiveness over time. It is designed specifically to fit most Glock pistols (17, 17L, 19, 22, 23, 24, 26, 27, 31, 32, 33, 34, 35) regardless of generation. Installation of the TA-1 is easy and requires no special tools or training, and the TA-1 is installed by removing your standard back plate, and sliding the TA-1 in its place. The designers at Chambermax have tactical LEO backgrounds and made this thing concealed carry friendly. 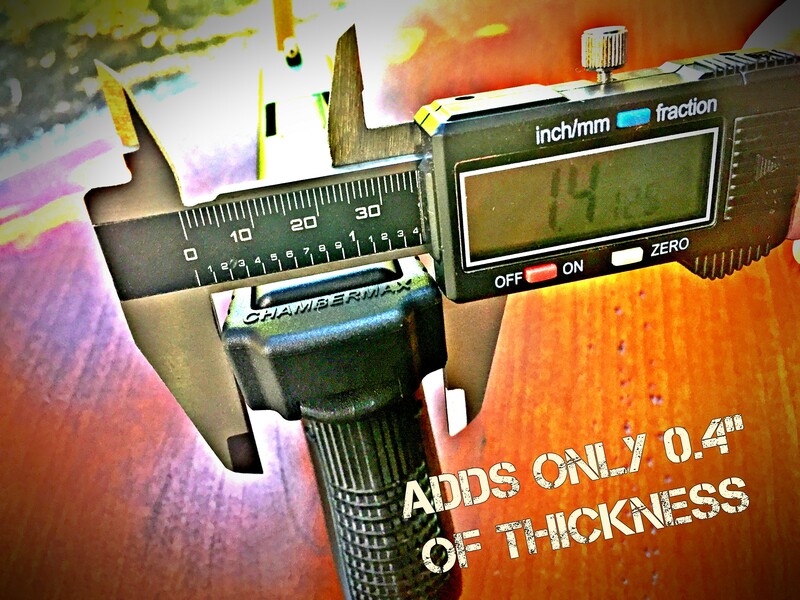 It provides more grip area, but still maintains a slim profile as it only adds 0.4″ to your slide's width. It comes in black or pink if you like to live dangerously. The TA-1 does not add a ton of bulk, just a ton of grip. Installing the TA-1 is incredibly simple. Holster compatibility was not an issue with me. I tried it with several different holsters and found it fit just fine. In one of my kydex holsters that have a sweat guard on it, it fit a little more snug against the sweat guard but did not hang up or cause any issues with retention. The only holsters I can imagine having a fit issue with the TA-1 would be duty holsters that as part of their retention have a ‘hood' that locks over the back part of the slide. I can think of a Blackhawk holster that is designed like this. Unfortunately I don't have that holster, and could not test it out, however, I couldn't find any documented issues with this holster. TA-1 should fit just fine in the majority of holsters. I found the TA-1 to be beneficial in administrative handling of the slide. I have absolutely no problems working the slide on my G27, but using this device just makes it so much easier. If you have ever dry fired for an extended period of time and racked your slide for what seems to be like a million times, sometimes your fingers can get fatigued. I found using this device eliminated that issue completely. I took my TA-1 equipped Glock 27 out to the range to get some live fire with the device. First off, the thing is durable and I didn't have any problems with it shifting, moving, flexing, or anything that you may be concerned with. In fact, on the Chambermax webpage, they show a video of them basically destroying a Chambermax that is attached to a Glock. They use the gun as a hammer, pounding on the TA-1, and then actually use a hammer on the TA-1. Impressively, the device holds up and performs exactly how it was designed. But does it provide an enhanced grip? Absolutely. 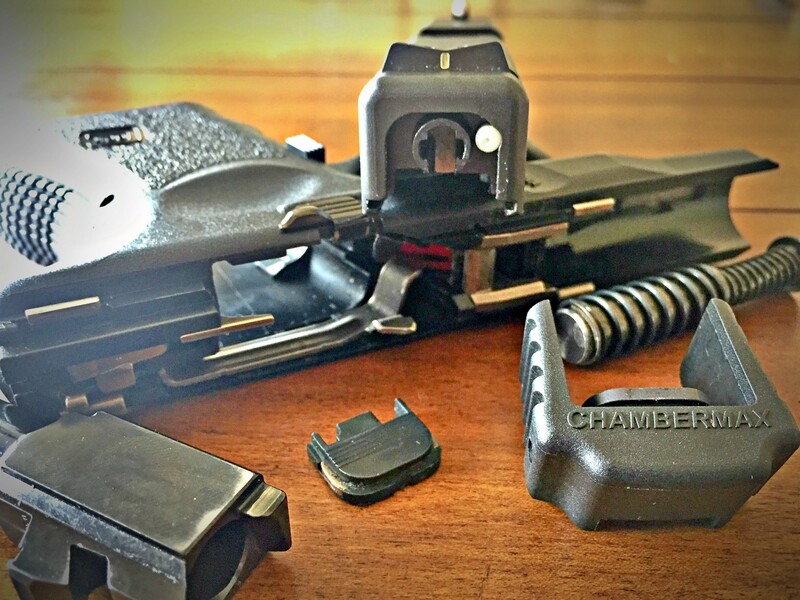 I ran the gun with gloves and without, and loaded several empty casings into my magazines to simulate stoppages. Each time I had a stoppage, I went into my immediate action drill, racked the slide and attempted to fire. I was impressed with my ability to grip the slide with gloves on. This is ALWAYS a more difficult task, and if you spend any time shooting with gloves you can back me up here. Clearing stoppages, even while wearing gloves is easier with the TA-1. And the cool gloves, are from Industrious Handwear. Here you can see my impressions of the TA-1 and some video of me using it on the range. I love this thing. The fact that it is basically an install it and forget it type device that doesn't require any modifications to my gun or holster makes it a no brainer. It is there when you need it, and doesn't bother you when you don't. 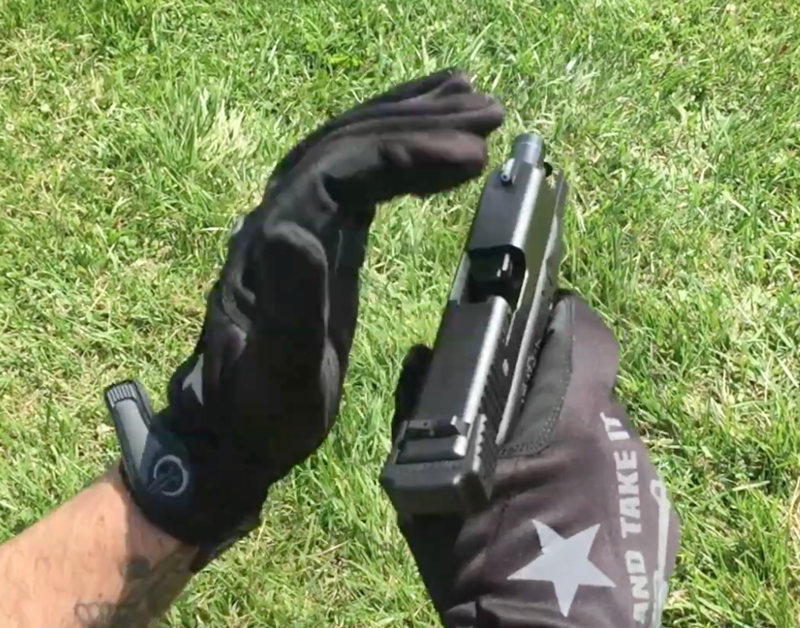 I feel the TA-1 will not only help those looking for some increased grip area in less than ideal tactical situations but provide some help to anyone who suffers from reduced hand strength. I especially like the durability of the product and that its effectiveness won't fade over time, or need to be replaced every so often. I would not be surprised to see the TA-1 come out in a version for the popular G43 9mm single stack in the future, although it is not currently available. After dry firing this thing a ton, and having it out on the range and running some drills with induced malfunctions which I needed to rack the slide to clear, and with and without gloves, I find this device to be a reliable addition to your tactical, duty or EDC firearm. Have you had a chance to check out these live fire drill cards? They are an incredible tool that will help you hone specific skills that are sure to make you a more competent shooter. Matthew, Thank you for the review. I am the creator of the Chambermax and (a bit of back story) the idea came out of an actual incident where a fellow officer and friend came very close to losing his life in a fight over his duty gun. He was ambushed by a suspect that had just killed another officer a few hours before. During the initial contact with the suspect, the suspect got a hold of his (the officers) gun, bloody, (sweaty from fighting) and gassed from the fight, he (the officer) was able to gain back control of sidearm but struggled (because of being seriously injured and the blood and sweat on his hands) with remediating the gun being out of battery. Luckily, due to training and diligence he was finally successful and killed the suspect that was trying to kill him. So ended the fight! I wont comment further as you did an extensive and tremendous job of reviewing and hitting all of the applicable points and concerns anyone should have about our product. I encourage all to give it a run, it does make a difference, Again Thank you for the review, Stay dangerous and diligent! Dave, Thank you so much for sharing the story that inspired you to create the product. I think one of the reasons this device appealed to me so much is that it is something that is not just a gimmicky product created to make a quick buck. It really does have great application and like I said the origin of the idea echoes this. I appreciate that you took the time to read the article and comment, it means a lot and I am very humbled. I hope more LEO’s and civilian gun owners see the product because I think it can be so very helpful. God bless and thank you again! Do you plan to make them for XD’s? Hi Ken, I am not sure if they are going to make them for XD’s but you can check the company web page to see if they do in the future. https://chambermax.us/ Thanks for the message!